Despite regularly making decisions that affect their crop yields, farmers in the developing world may lack information about how to appropriately use farming inputs or techniques. For instance, a farmer must decide on the optimal timing of planting, the depth and spacing of seeds, the amount of fertilizer to use, and the timing of fertilizer use, among other things. Farmers may be reluctant to engage in potentially risky experimentation on their own plots, which prevents them from gathering new information about efficient agricultural practices. And even when farmers have information available to them about ways to increase their yields, they may not adopt optimal agricultural practices. One explanation for this is that farmers fail to notice certain details about the cultivation process simply because they may not believe that information to be useful. This suggests that it could be possible for farmers to learn about optimal farming techniques if they are presented with information that helps them notice new or previously neglected dimensions of the production process. Seaweed farming has been prominent in Nusa Penida district in Bali, Indonesia since it was introduced during the 1980s. Most seaweed is cultivated by taking raw seaweed and cutting it into pods, which are then planted at intervals along the ocean floor. The size of the pods and distance between them is determined by the farmer. 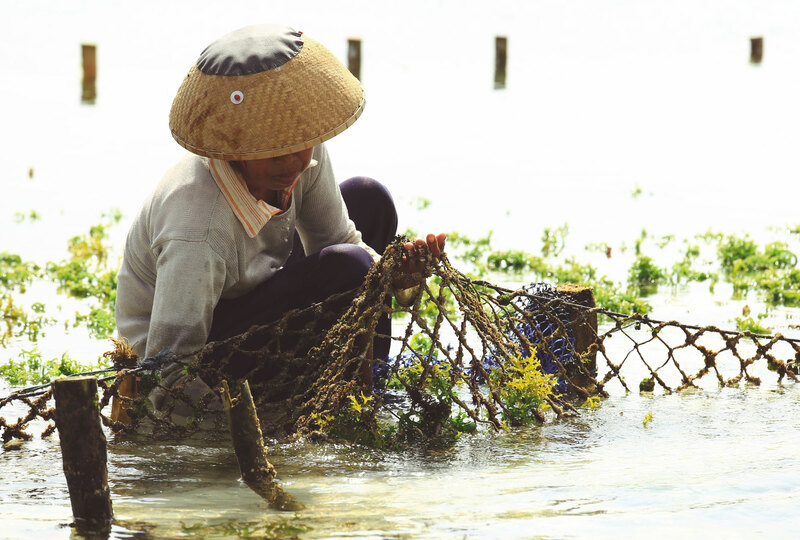 Due to its relatively short crop cycle of 35 to 40 days, seaweed cultivation provides farmers with ample opportunity to learn through experimentation and implement new techniques. However, 86 percent of seaweed farmers sampled were unable to provide information about the pod size they used on their plots or what they believed to be the optimal pod size for seaweed cultivation. From a group of 232 seaweed farmers, researchers randomly selected 117 to participate in an experimental trial to determine the optimal pod size for seaweed cultivation on their plots. Farmers in the treatment group assisted an agricultural extension worker to vary the seaweed production methods on one of their plots and received the trial results afterwards. The remaining 115 farmers served as the comparison group and received no new services. The farmers in the treatment group were randomly assigned to one of two sub-groups that varied the size and weight of seaweed pods. Pod Size Treatment: Researchers collected data on the variation in pod size within each farmer’s plot to understand whether farmers could achieve a higher yield by systematically planting pods of a specific size. Pod Weight Treatment: Researchers collected data on how variation in the weight and distance between pods affected the yield. In both cases, farmers observed as enumerators planted the seaweed pods. All farmers in the treatment group received compensation for their participation in the form of farming inputs, a guaranteed income from the plot they cultivated as part of the trial, and a small gift worth US $1. Researchers conducted a follow-up survey from April to May 2008 to test whether farmers changed any of their methods after participating in the trial. After the first follow-up survey, farmers were given summarized trial results, which included information on the returns from different farming methods and highlighted which pod size and pod weight produced the highest yields, respectively. Enumerators talked through the results with the farmers, in addition to providing them with a written summary. Two months after the results were distributed, researchers conducted a second follow-up survey to determine whether farmers had changed their methods as a result of having received the trial results. Researchers found that farmers neglect certain dimensions of seaweed cultivation and fail to use the optimal level of inputs along those neglected dimensions. For instance, while most farmers are attentive to the optimal distance between seaweed pods, very few farmers had consciously experimented with pod size prior to the trial. Participation in the trial alone did not induce a significant change in farming techniques, which suggests that learning through observation and experience does not always guarantee effective use of technology. However, farmers in the treatment group report making large and significant changes in their production techniques after receiving summarized trial results and specific recommendations about which pod size or weight improved yields. The number of farmers who reported changing their techniques increased by 16 percentage points between the first and the second follow-up surveys. Similarly, pod size increased by approximately 7 grams in the pod-size treatment sub-group relative to the comparison group. This was consistent with the average change in pod size recommended by enumerators. Thus, while farmers did not appear to consider pod size to be an important part of the production process prior to the trials, providing summary information on the optimal pod size appeared to change their use of this production input. This suggests that farmers who fail to notice may not learn even when they are actively experimenting and, as a result, may not notice the very features of a technology that make it profitable. Training programs for farmers may be useful, not only for new technologies, but also for existing technologies that individuals may have had prior experience with. Hanna, Rema, Sendhil Mullainathan, and Joshua Schwartzstein. "Learning Through Noticing: Theory and Experimental Evidence in Farming." Working Paper, Harvard University, February 29, 2012.